Out of the Box Publishing is no longer in business. They sold all of their remaining inventory and ceased operations in October 2015. 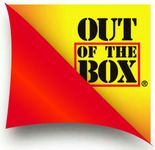 Out of the Box Publishing is a Dodgeville, Wisconsin based Publishing Company specializing in family, card and party games. As of December 2008, they have published over 45 titles. Out of the Box Publishing is best known for party games that are innovative, easy to learn and quick to play. The company has received numerous awards including Mensa Select, Toy of the Year and National Parenting Center. Circa 2012, Out of the Box Publishing closed their doors.